I’ve had so many requests for this recipe I’ve decided to post it. It’s based on a recipe from the Natco website, but you might find this easier to follow. The ingredients are in the order you’ll need them. I am somewhat generous in my interpretation of teaspoon quantities. You can substitute different types of lentils. I soak the lentils in cold water for 5 or so hours, changing the water hourly. Overnight is okay but change water last thing before bed and again when you get up. Rinse the lentils through until the water is reasonably clear then transfer to a large saucepan. I make up the stock with boiling water. (You can choose here whether to use gluten-free stock mix). Pour into the saucepan, add the turmeric, the coriander and bring to the boil and simmer very gently for at least 20 mins. Add salt and pepper to taste. Whilst the dahl is cooking prepare the ingredients for the tarka. This is how you introduce the interesting flavours into the dahl. Heat the oil and butter in a medium frying pan and briefly fry the cummin seeds (15 secs) then add the onion and the garlic. Cook gently over a medium heat until the onions start to brown. Add the chopped chillies and dried chilli seed. Cook for a minute or so then add the chopped tomatoes and cook for up to 5 mins. To make sure I get every trace of the tarka into the dahl, I ladle some of the dahl into the frying pan with the tarka, stir it well and transfer everything back into the saucepan. Add the garam masala and continue to cook on the stove for as long as you like or transfer to a slow cooker. If leaving on the stove be careful it doesn’t stick to the bottom of the pan. 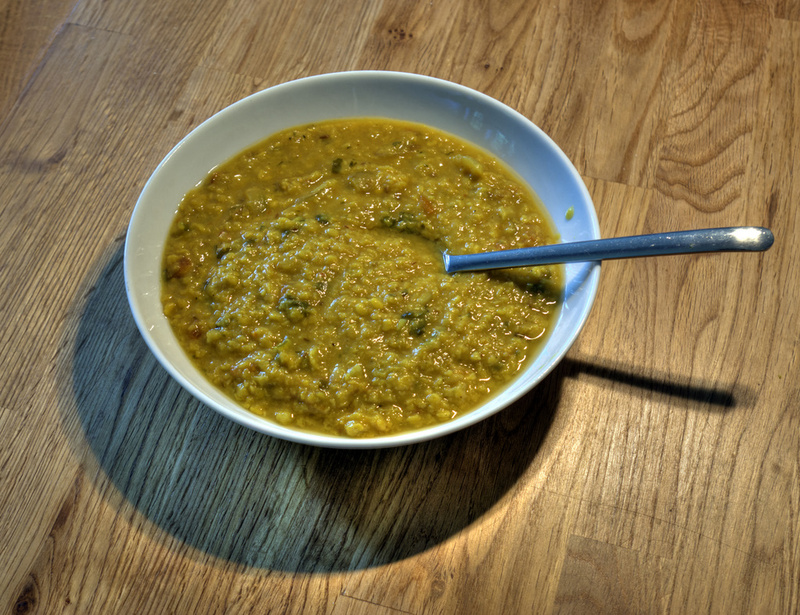 Twenty minutes on the stove is sufficient for a very acceptable tarka dahl. Cooking longer makes it softer. You may need to add boiling water. Don’t let it get too stodgy. Add the coriander a few minutes before serving. Serve with naan bread, baked potatoes or plain rice. As a main meal it will serve about 5 people.